El Diente, located five kilometers north of Guadalajara’s Ring Road, is a forest of giant monoliths, a favorite place for local rock climbers to hone their skills. Now comes the revelation that El Diente is also an important archaeological site. 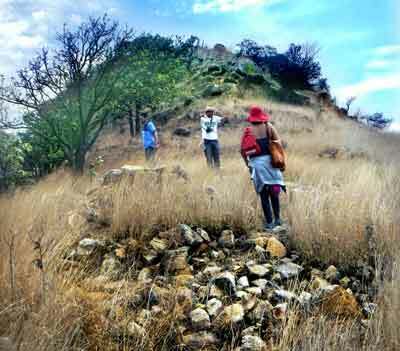 A high hill entirely covered with monumental ruins was discovered there recently by archaeologist Francisco Sánchez and last Sunday I had the pleasure of touring the site with the discoverer himself. 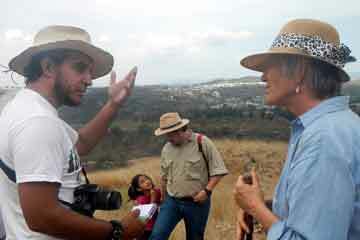 This visit was organized by CIDYT, the Center for Dialog and Multidisciplinary Research, located in the Nixticuil Forest, which links El Diente to other wooded areas of Zapopan. I could see why this spot was chosen for a pyramid: the view was absolutely breathtaking. Wildlife experts add that El Diente should remain connected to the Nixticuil Forest and not cut off by housing developments. Sánchez returned to his native Guadalajara only to discover there is no place to study archaeology anywhere in Jalisco. He ended up enrolling in the National School of Anthropology and History in Mexico City and now specializes in a branch of Archaeometry which studies the colors in ceramic shards with a Scanning Electron Microscope. Because looting is a major problem at archaeological sites in western Mexico, I can’t make the directions to these ruins public. Let’s hope that funds may be found to study and perhaps even restore this once glorious ceremonial center of the ancient Cricket Nation.